That may be good news for consumers, since some Champagne houses have cut their prices in half to unload some of the surplus, which may not be great news for Cava producers from Spain, who already sell some great sparkling wines at already very reasonable prices. There is also a huge surplus in Catalunya's Cava country, where 95% of Spanish sparking wines are made, so Cava prices most likely will also be dropping, but Cava sales are up in the American market, according to Eric Asimov of The New York Times. Cava for "breakfast" at Bar Pinotxo in La Bouquería, Barcelona. ÉPERNAY, France — "For generations of French Champagne makers, the threat of calamity has been a constant companion, whether it is winter freezes or spring frosts, phylloxera parasites or Nazi occupiers. Now add to the list a drop in Champagne sales in all the top export markets, particularly the United States, Britain and Japan. All had seemed to have insatiable appetites for the extravagant, delicate bubbles in recent years — until popping housing bubbles sent the global economy into a downturn. The weak currencies in those export markets have also hurt." Read the rest of the article. Gerry Dawes drinking rosé Champagne with Emiliano García at Casa Montaña. "As the Champagne price war hots up, Tesco has asked suppliers to find it 300,000 bottles it can sell for £10 each, and Bollinger can be had for a song. All the major brands are involved in the supermarkets' battle for customers. Next Monday Morrisons will offer Bollinger, Moët & Chandon, Lanson Black Label and Nicolas Feuillatte all at less than half price." -- Giles Fallowfield, Decanter magazine, November 19, 2009. 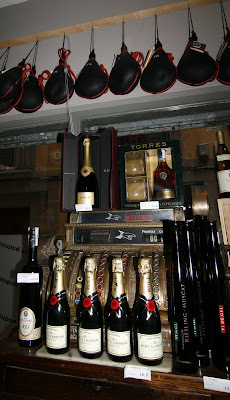 Champagne and wine botas in El Celler de la Boquería, Barcelona. 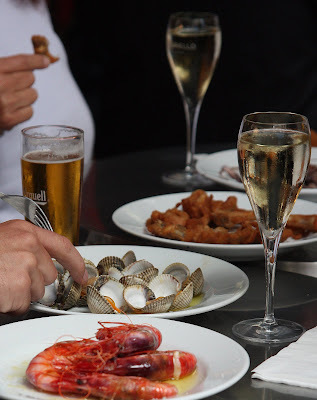 Hi Gerry, great video about your trip to Valencia and Alicante. How can we see more of this stuff!